What could be more fun than shopping & polymer clay? Having a polymer clay haul of course! This WIP Wednesday is going to look a little different. Why? Well because instead of being in my studio in 90 degree weather (very hard to work when there’s no A/C and the clay smooshes right between your fingers) my hubby and I worked together to do this … stain the deck. So in a manner of speaking I was still being “artistic” just not with clay. You can see the “raw wood” on the decking and the stain color on the side walls. Why A Polymer Clay Haul? This month I picked up a few goodies from Christi Friesen’s online shop. I shop there frequently. This haul included two of her newest stamps: Fantasy Wings & Van Gogh. I also purchased some steampunk components and the new Surface FX, Fairy Tale. The only thing I purchased from Lisa this time around was some gorgeous stamps that I didn’t have. I have many of Lisa’s stamps and use them for all kinds of things. So naturally, I add to that collection every once and awhile. This time around I purchased the absolutely unique Cloodle stamp, Ancient Doodles stamp, and the stamp I’ve wanted the longest … love letter! First, let me say that Pat Catan’s is one of my favorite places to get craft supplies locally. The prices are low, they have periodic sales, send out special coupons occasionally, and have a huge assortment of hobby disciplines & genre’s. I rarely order polymer clay online. Why? I live out in the middle of nowhere. I worry that my clay will begin to cure due to improper handling on the way. Plus, I like to be sure my clay is fresh. Going to the store is one of the best ways to do that. However, this also limits my choices to Fimo, Premo!, & Sculpey III. As I have stated over & over again, my choice every time is Premo. 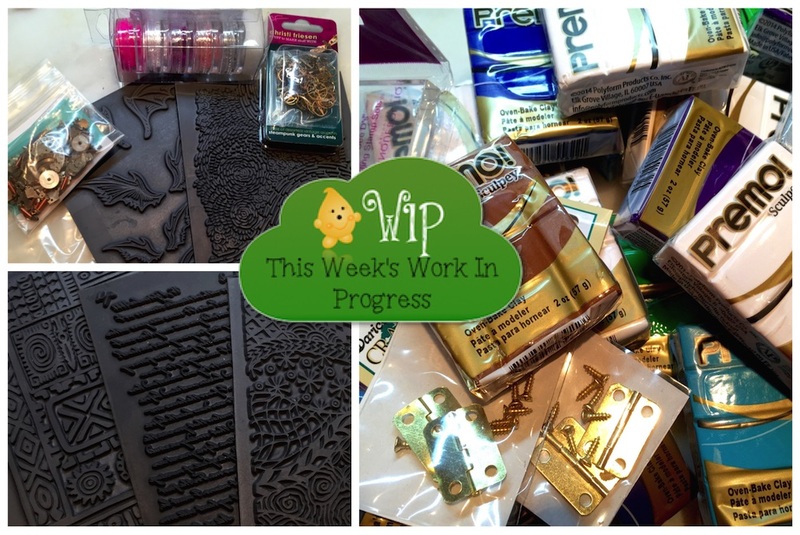 Here’s what I purchased in my most recent haul: acrylic blocks, tiny brass hinge sets for an upcoming project, and about 25 bars of Premo! polymer clay. There’s a really GREAT giveaway coming soon from three special polymer artists. Be sure that you are signed up to get the announcement and be entered to win. New video tutorial is also coming soon. Be sure to subscribe to my channel on YouTube so you don’t miss it. Do you want to make a fall necklace? Here’s a free tutorial you might enjoy. I just decorated my first wine glass. Took it out of the oven and I think I am hooked. This one was simple compared to what I want to do! I LOVE working with my clay and soon will have a dedicated space to play in! Great job Deb! Making things you’ve never made before is always very exciting.